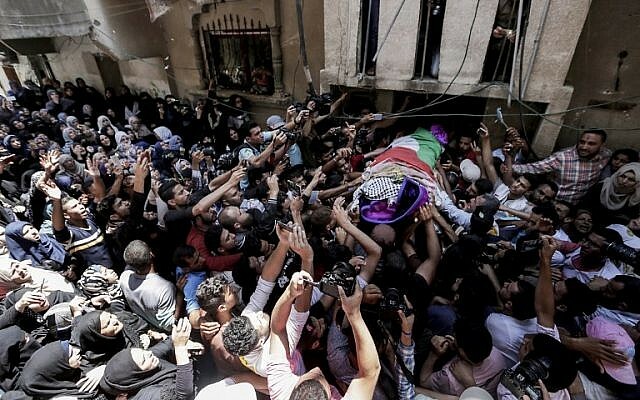 Thousands of Palestinians attended the funeral Saturday of a young female volunteer nurse, who Palestinians say was shot and killed by the IDF while tending the injured during violent protests on the Gaza border. Razan al-Najjar, 21, a volunteer with the Gaza health ministry, was fatally shot in the chest near Khan Younis on Friday, Palestinian officials said. Ambulances and medical crews attended the funeral, with her father holding the white blood-stained medics’ jacket she wore when she was shot, as mourners called for revenge. Shots were fired at an army vehicle and a Palestinian had crossed into Israel, planted a grenade and returned to Gaza, the army said. Najjar was less than 100 yards from the border fence, treating a man who been struck by a tear gas canister, when she was shot, according a relative, Ibrahim al-Najjar, who was there and who said he carried her to an ambulance. “I told her it was dangerous to approach [the fence] but she answered that she was not afraid to die and wanted to help the young man,” a fellow medic told Gaza reporters, according to Haaretz. 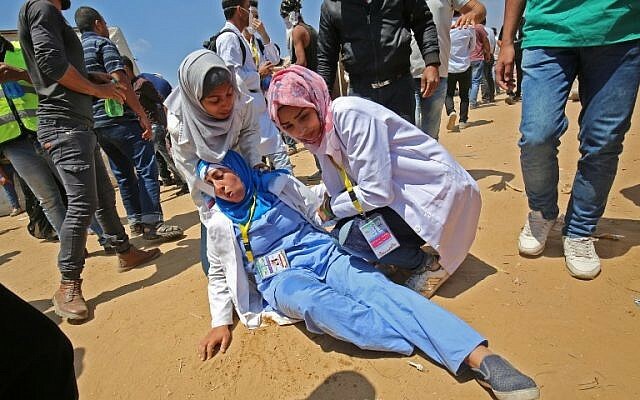 The Palestinian Medical Relief Society said Najjar was shot “as she was attempting to provide first aid to an injured protester,” and was among three other first responders also hit by live fire on Friday. In addition to the comments made at a conference in Wadi Ara, Tibi sarcastically tweeted that the sniper is a soldier in the “most moral army in the world,” a description frequently used by Israeli politicians and advocates to describe the IDF. Najjar had given an interview to the New York Times last month in which she proudly discussed her position as a female volunteer medic. “Being a medic is not only a job for a man. It’s for women, too,” she told the Times. Najjar had reportedly been among the first volunteer medics at the protest camp in Khan Younis. “The strength that I showed the first day of the protests, I dare you to find it in anyone else,” she told the Times.